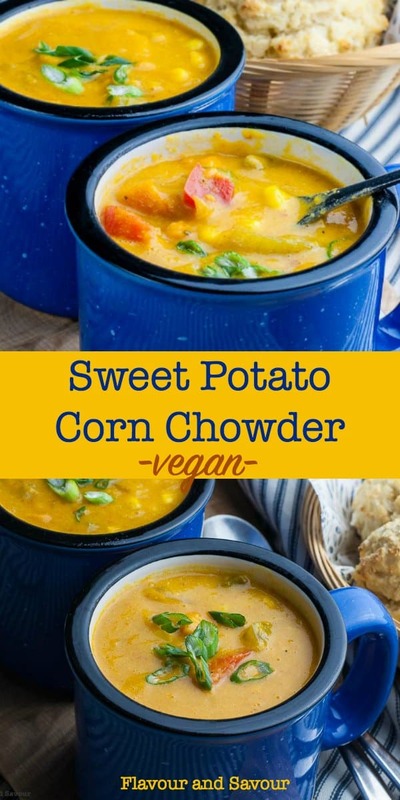 This Vegan Sweet Potato Corn Chowder is thick and chunky, slightly sweet and slightly spicy. 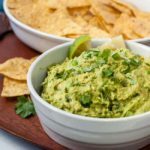 It’s free of fat, dairy, meat, and gluten, and it’s incredibly delicious! Can I interest you in a warm bowl of vegan Sweet Potato Corn Chowder? 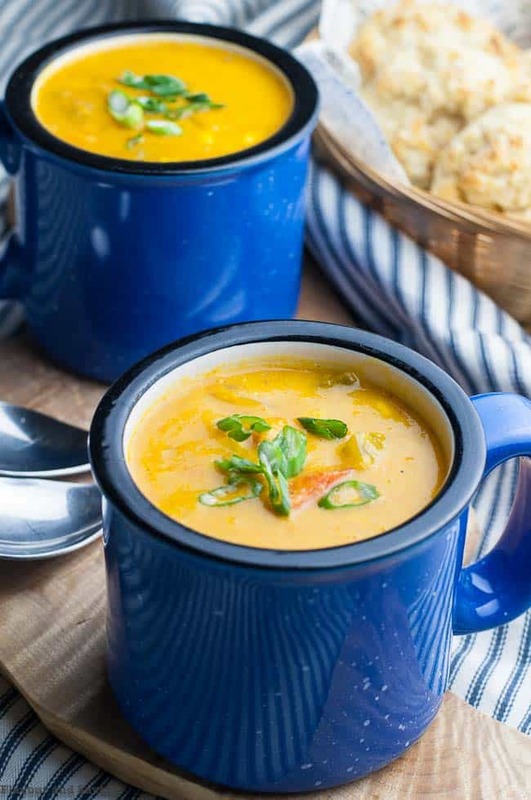 This wholesome vegetarian chowder has a natural sweetness from corn kernels and just enough spice to keep it interesting. It’s velvety smooth with chunks of sweet red pepper, onions, celery, corn kernels, and sweet potatoes, of course. Guaranteed to warm your tummy on a chilly day! 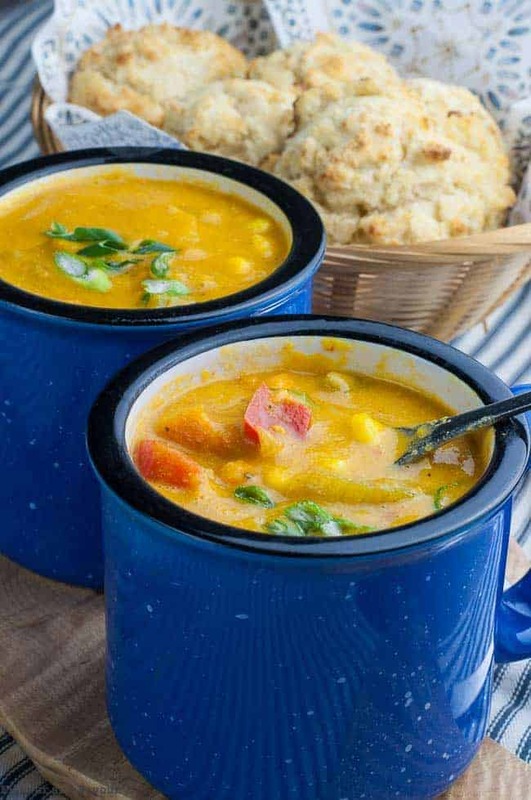 Not only that, but this vegan corn chowder recipe is an easy one. It’s cooked in one pot on the stove top with ingredients you probably have on hand. Ready to eat in about half an hour, it’s perfect for those on special diets. It has no meat, no dairy, no gluten, or oil! It’s a bowl full of nutritious yum. I don’t eat corn very often. Corn is often genetically modified and in Canada, food is not required to be labeled GMO. Bags of frozen organic corn are easy to find in supermarkets, however, so that’s what I used in this chowder recipe. Earlier this week, I was out for lunch with friends. I spotted Sweet Potato Corn Chowder on the menu and decided to give it a try. Three of the four of us ordered it and it was a hit. While we were chatting, I was secretly analyzing the ingredients, knowing that I was going to head home and try my best to reproduce it! Let’s get started! You’ll need a big pot. Begin by adding the onion, celery and garlic to the pot. You don’t need oil. Simply add about 1/3 cup of vegetable stock to the pot and cook until the onions and celery are softening. Next, add the sweet potatoes, vegetable stock and seasonings. Cook for about 10 minutes. Add the red bell pepper and corn and continue to cook until the sweet potatoes are tender. Transfer 2/3 of the chowder to a blender and process until smooth. Pour it back into the pot. Taste to check the seasoning and correct to your liking. It’s ready to serve! Make this Chowder your Own! I kept the spice level to a minimum to let the natural flavours of the sweet potatoes and corn shine. You might like it spicier, so you could increase the amount of chili powder. If you’d like a smoky flavour, try 1/2 teaspoon of smoked paprika instead of the regular paprika. Remember, you can always add more seasoning, but it’s difficult to tone down something that has been over-seasoned. Sweet Potatoes or Yams: What the difference? 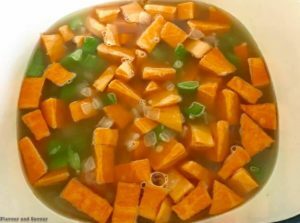 Even though they are often referred to as yams in North American supermarkets, those sweet orange-coloured root vegetables are actually sweet potatoes. Sweet potatoes come in a variety of colours, even purple. 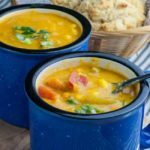 Depending on which name you’re most familiar with, this recipe could also be called Yam Corn Chowder! True yams are quite different. We almost made the mistake of buying yams when we were in the Caribbean, where they are readily available. Markets there carry true yams which are a very starchy, rough-looking root vegetable. They are not rich in beta-carotene like our sweet potatoes. 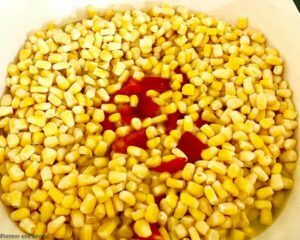 This easy vegan corn chowder recipe makes a great lunch. It would also be good as a starter for a casual meal or a barbecue. It’s satisfying and filling enough for a soup and salad dinner, especially when served with fresh-from-the-oven gluten-free baking powder biscuits! 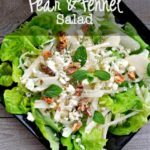 Have it for dinner, then save some for tomorrow’s lunch! 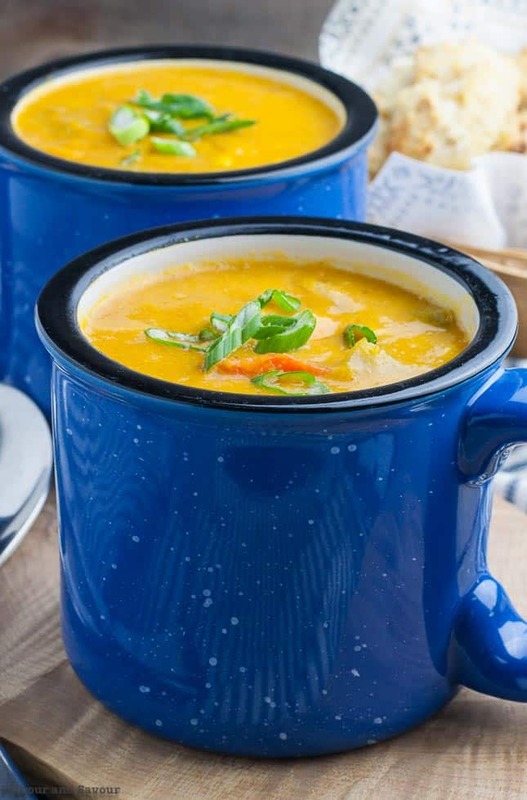 This Sweet Potato Corn Chowder is thick and chunky, slightly sweet and slightly spicy. 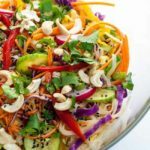 It's free of oil, dairy, meat, and gluten, and it's incredibly delicious! Heat a large heavy-bottomed pot over medium heat. 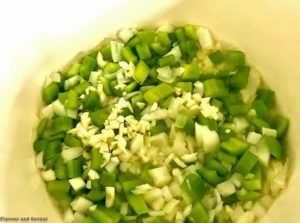 Add diced onion, celery and garlic with 1/3 cup vegetable stock and cook until onions and celery begin to soften, about 4 - 5 minutes. Add sweet potato and vegetable broth, stir, bring to a boil, then reduce heat to simmer. Cook for 8 - 10 minutes. Add red pepper, corn kernels and all seasonings. Simmer until sweet potato is fork-tender. Transfer 2/3 of the chowder to a blender. Blend until smooth, then return to the pot. Taste to check the seasoning. Serve. Refrigerate leftovers in a tightly sealed container for up to 4-5 days. Freeze for up to 3 months. 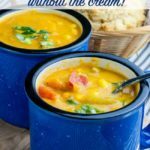 Like easy hearty soup and chowder recipes? Try these ones, too. This post may contain affiliate links. If you click on any of the affiliate links and make a purchase within a certain time frame, I’ll receive a small commission. The commission is paid by the third party, not by you. I am a participant in the Amazon Services LLC Associates Program. It’s an affiliate advertising program designed to provide a means for me to earn fees by linking to Amazon.com and affiliated sites. 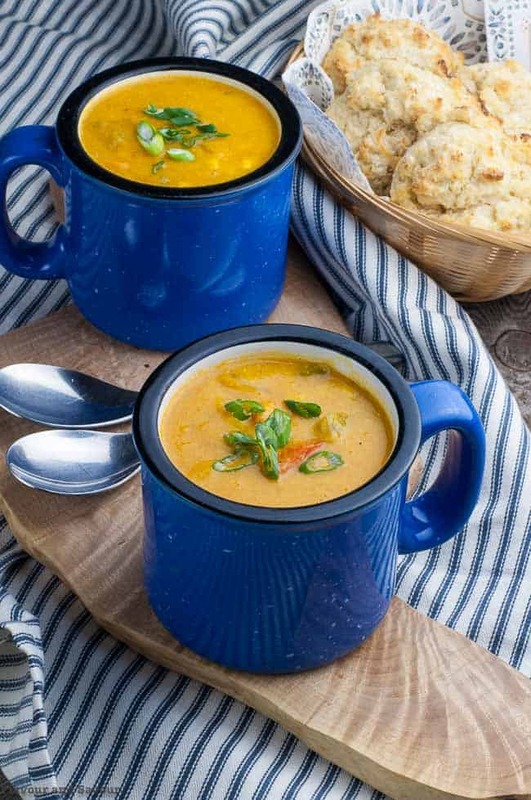 Yes, you could certainly interest me in a bowl of this vegan sweet potato corn chowder! Sounds absolutely delicious, looks creamy dreamy, warming and just what this cold day needs! Love those cups too 🙂 Pinned! Thanks Dawn!It’s creamy without the cream! Nothing beats a good hearty bowl of comforting soup. I really enjoy the vegetable variations too! You’re so right, Wanda. Cold days call for warm creamy soup! Yum, I love the sweet potato, corn combo. It sounds like it belongs together! Delicious, and I think the hint of spice from the red pepper flakes is perfect. Thanks Colleen! 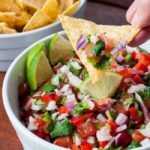 This recipe is easy to adapt to make it spicier if you like. Loving the flavors and textures of this soup! Looks so hearty and delicious! I enjoy hearty vegetarian soups, and it’s a bonus that this one is vegan too! Looks warm and chunky. Perfect for the cold weather we’ve been having on the east coast! Thanks so much Denise! Hope you love this one, too! 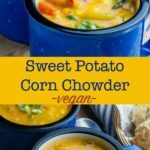 So great to find a vegan alternative to corn chowder that still delivers that creamy texture, without the cream. The combination of flavours here is completely timeless and endlessly satisfying. 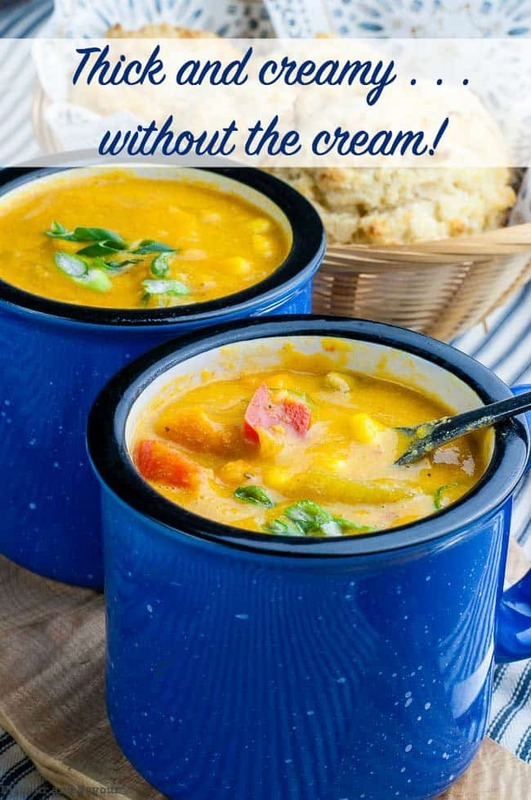 I have never made corn chowder and have always wanted to – would love to try this! It sounds and looks so delicious! Love the use of sweet potato, no need for cream. It looks absolutely warming and delicious.